DIE Martis, 27 die Novembris. Bill for regulating Prices of Provisions. Ld. Rockingham, Privilege: Dr. Wake brought to the Bar. Baud, his Servant, to be brought to the Bar. This Day the Lord Privy Seal sat Speaker, by virtue of a Commission under the Great Seal of England, in the Absence of the Lord Chancellor, being indisposed in his Health. The said Commission was read before the Sitting of the House. ORDERED, That the Committee for preparing a Bill to rate Victuals and Provisions (being now Sine Die) shall meet on Saturday next, at Three of the Clock in the Afternoon. ORDERED, That the Committee for the Earl of Cleveland's Bill do meet on Thursday next, in the Afternoon, at Three of the Clock, in the Prince's Lodgings; and have Power to adjourn from Time to Time, as there shall be Occasion. And the Lord Chief Justice of the Court of Common Pleas and the Lord Chief Baron of the Court of Exchequer, and Judge Twisden, or any Two of them, are to assist their Lordships. This Day Doctor George Wake was brought to the Bar, as a Delinquent, upon the Complaint of the Lord Rockingham. He professed his great Honour and Respects to the Peerage of England; and acknowledged his hearty Sorrow for his Offence committed against this House in this Particular, and expressed his Sorrow for his Offence to the Lord of Rockingham; and desired the Pardon of this House, and also of his Lordship. Upon Complaint made to this House, "That William Baud Esquire, menial Servant to the Marquis of Worcester, a Peer of this Realm, is detained in the Prison of the King's Bench, by Sir John Lenthall Knight, Keeper of the said Prison, or his Deputies, contrary to the Privilege of Parliament." 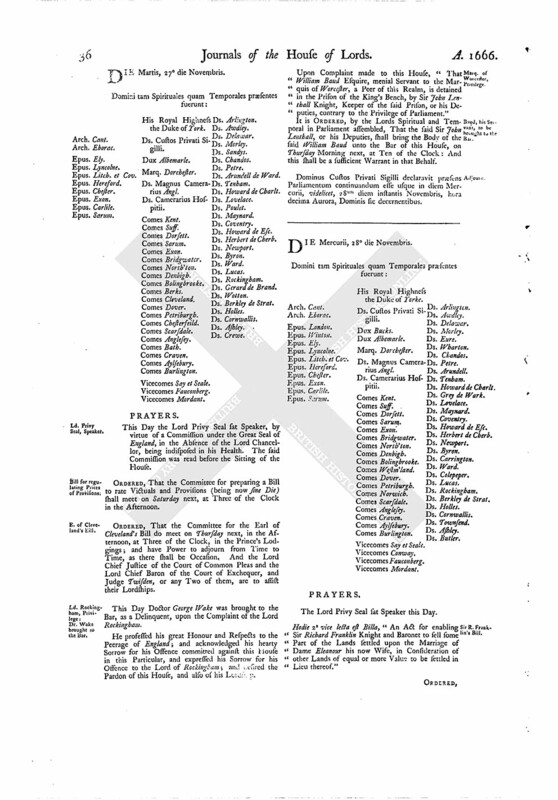 It is ORDERED, by the Lords Spiritual and Temporal in Parliament assembled, That the said Sir John Lenthall, or his Deputies, shall bring the Body of the said William Baud unto the Bar of this House, on Thursday Morning next, at Ten of the Clock: And this shall be a sufficient Warrant in that Behalf. Dominus Custos Privati Sigilli declaravit præsens Parliamentum continuandum esse usque in diem Mercurii, videlicet, 28um diem instantis Novembris, hora decima Aurora, Dominis sic decernentibus.